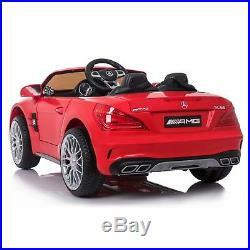 Mercedes SL65 Ride on Car. 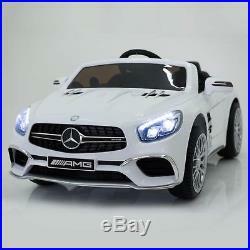 These Officially Licensed Mercedes SL65 Ride on Cars are the ideal gifts for the youngest car enthusiasts. The cars have a recommended age range of 3-8 years (max user weight 30kg), and have plenty of features to keep them entertained whilst out and about in their new car. With everything from key start ignition to the working LED headlights, every little detail has been thought of to make sure the cars are as close as possible to the real thing! Driving the Ride on Car. 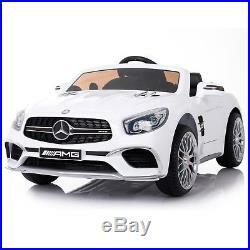 These ride on cars offer parents the choice of remotely controlling the car or handing over control to their child in the driving seat. The remote handset 20m range, (AAA batteries NOT included) is ideal for giving parents control whilst the child is getting used to the car, and for keeping them safe in busy areas. The car itself has one pedal, which when released applies an auto-brake function. This keeps the car both easy and safe to use for the child. It has a top speed of 5km/h, with 3 different speed options to make sure they don't drive off into the distance. The car also has a reverse gear backing out of tricky spots. 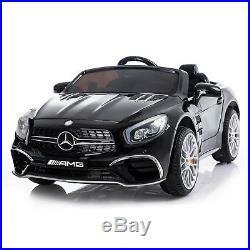 The car is impressively detailed with every consideration taken into account to make the car as realistic as possible for the child. 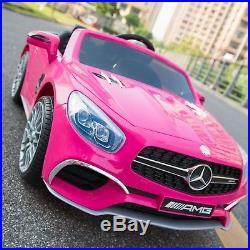 The car has a pair of opening doors, as well as a boot for storing toys and snacks for the road. 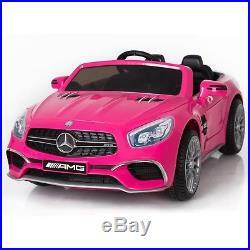 The car has key start ignition, alongside a working horn and speakers which play music. It even has an SD card slot, USB slot and MP3 input for playing their own music on the move. The seat itself includes two seat belts, giving both the driver and a passenger safety on the move, and is adjustable to 3 settings. The SL65 has front and rear suspension, as well as working front and rear LED headlights to complete the look of the car. 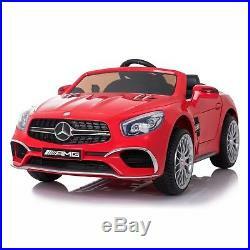 These ride on Mercedes SL65s have a 12 Volt battery which allows for up to an hour of drive time when fully charged. The car dash even has a battery power indicator to let you know when you're in need of a charge. Charging the battery is impressively easy. The car as a removable battery charge port, which allows you to leave the car in the garage whilst you bring in only the essential bit to plug into the mains to charge. This is a whole lot easier than having to carry the whole car inside to charge it! Ride On Mercedes SL65 Specifications. Recommended ages 3-8 years (max user weight 30kg). EU toy safety standard certificates: EN71, EN61125. 3 speeds (max 3-5km/h) plus reverse. 1 pedal with auto brake on release. Remote handset for parental control (max range 20m). 12V Battery with 1 hour drive time (6-12 hour charge time). MP3 input, SD card slot and USB port. 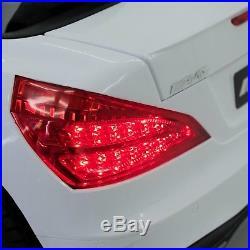 Working front and rear LED headlights. 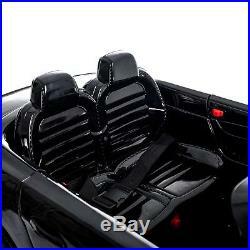 Adjustable seat with 2 safety belts. 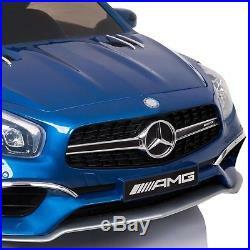 1x Mercedes SL65 ride on car. 1x Parental remote control handset (2.4G) (2x AAA batteries, NOT included). 1x Electric Car Battery with Charger (12V 1000mA). 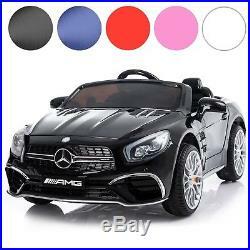 The item "MERCEDES SL65 Ride on Car Official AMG Merc Childrens Electric 12V Kids RC Toy" is in sale since Wednesday, October 24, 2018. This item is in the category "Toys & Games\Outdoor Toys & Activities\Ride-on Cars\Electric & Battery Powered".ltd" and is located in Woodhurst. This item can be shipped to United Kingdom.